PACKET PICKUP There will be 3 packet pickups the week before the race at Fit2Run in St. Pete and Tampa, and on race morning at Madeira Beach City Hall (race site). See the packet pickup schedule here. THE COURSE The half marathon and 10K course is accurately measured and USATF certified, starting in Madeira Beach, heading north on Gulf Boulevard through exclusive residential and commercial communities to Indian Shores, before heading inland to Seminole, north along the smoothly paved Pinellas Trail into shaded and scenic Taylor Park, to the lakefront finish line, the perfect place to relax, recover, listen to live music, eat our homemade hot food, and enjoy some ice-cold beverages. Afterwards, free shuttle buses will return you to your vehicle near the start line. We invite you to join the 18th Annual Florida Holiday Halfathon & 10K, our point-to-point course, which is fast, flat, scenic and aesthetically varied: just one small bridge (Park Boulevard Bridge, four miles into the course) and two overpasses, with the rest of the course 10 – 25 feet above sea level. NEW! We’ve added the 10K to our Holiday Halfathon. 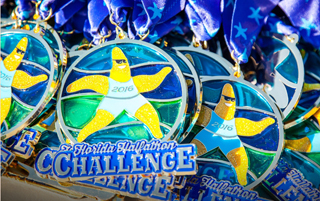 The 10K allows athletes not up for the half marathon distance an opportunity to participate in one of Pinellas County’s most popular Holiday races and earn the gorgeous Holiday finisher medal.